Jan Wilson, L.Ac. Dipl.Ac. M.Ac. I became attracted to learning about Chinese Medicine when I myself experienced deep healing during a series of acupuncture treatments following a car accident. After having completed all Western treatments available something was still ‘off’. After acupuncture I was finally restored and I decided then to pursue acupuncture school. I earned my master’s degree in acupuncture at the Won Institute of Graduate Studies in Glenside, Pennsylvania. After graduation, I completed an externship in Nanjing, China, at the University of Nanjing’s Traditional Chinese Medical College. I am registered to practice acupuncture by the Pennsylvania State Medical Board. I am certified as a Diplomate of Acupuncture by the National Certification Commission for Acupuncture and Oriental Medicine (NCCAOM). I am on the board of the Association for Professional Acupuncture in Pennsylvania (APA). 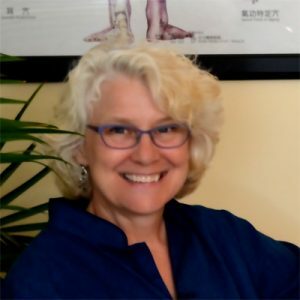 I offer acupuncture treatments, nutritional counseling and lifestyle guidance targeted to your immediate health concerns and the strengthening of your unique physical, emotional, and spiritual constitution. Whether you are dealing with complex health issues, seeking relief from stress, or hoping to improve your general well-being, I will work with you to find the most effective course of action individually tailored to your needs.